The Lagos State Government has said that it will deploy additional 10,000 High Definition CCTV cameras across the state as part of the comprehensive Smart City Programme designed to provide a 24-hour driven economy. Commissioner for Science and Technology, Hakeem Fahm who disclosed this on Friday during a briefing to mark the third anniversary of f Governor Akinwunmi Ambode’s administration. He said the smart city initiative, was intended to allow the people and companies operate in a safe and secure environment thereby creating more jobs and increasing the Gross Domestic Product (GDP) of the State. Giving details, the Commissioner said the focus of the smart city programme basically includes provision of security and surveillance, implementation of a metro fibre network and e-Governance, adding that apart from HD cameras with gantries deployed in the first phase, another scope of the project involves integration of the deployed cameras with Centralized Emergency Command and Control Centre (CCC), provision of road signature structure and street lights across the State. 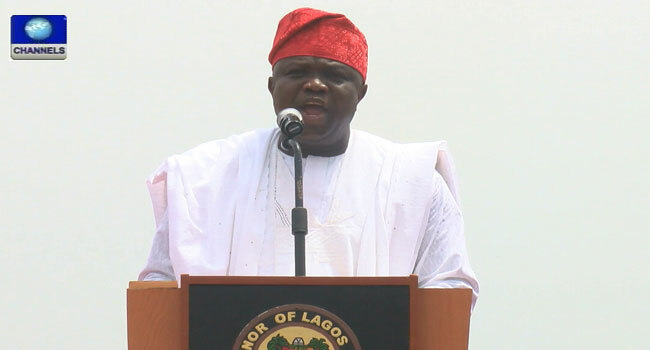 “In the second phase of the project, we will be deploying 10,000 HD cameras, world-class e-Government solution and data centre solution, one key alarm, metro fibre network to serve as backbone for communication and unified communications with smartphones for first respondent agencies such as police, fire service, Lagos State Traffic Management Authority (LASTMA), Lagos State Ambulance Service (LASAMBUS), Vehicle Inspection Office (VIO), among others,” Fahm said. He said the initiative would address security, transportation, and infrastructure in a sustainable manner, adding that thousands of surveillance CCTV cameras would eventually be deployed across the length and breadth of the State. “The security component will deploy thousands of surveillance CCTV cameras through the length and breadth of the State. The transportation component focuses on Intelligent Transport Service (ITS) and the connectivity component with the provision of a metro fibre network through a major Internet Service Provider (IPS) that will eventually lead connectivity to various homes, offices and institutions in the State,” Fahm said. On activities of the Ministry in the last one year, the Commissioner said it was gratifying to report major portals being developed such as Driver’s Licence Processing and Verification Portals to ease the process of driver’s licence issuance and verification of vehicle registration, Education portals to enhance learning and registration of private schools, while Land Use Charge portal and Citizens Gate app, a platform where residents can engage with government online, were successfully implemented. He said through the Lagos State Online recruitment and testing portal, a total of 1,500 Local Government staff were recruited in November 2017, while free Wi-fi was provided at three selected parks and gardens across the State with plans to provide additional Wi-fi access at bus terminals and several parks and gardens in the State. On Yaba Information Communication Technology (ICT) hub, the Commissioner said the project was another eloquent example of the commitment of the present administration to truly create another Silicon Valley in the State where new set of entrepreneurs and innovators would be raised to address the challenges confronting the nation in the ICT sector. He said upon successful completion of the project, Lagos would become the catalyst for Information Technology (IT) penetration and enablement not just in Nigeria but Africa. While alluding to the activities of the Lagos State Residents Registration Agency (LASRRA), the Commissioner said in line with the mandate of the agency to register and issue residency card to residents thereby providing government with reliable demographic database to assist in effective planning and allocation of resources, over four million residents have so far been captured through deliberate strategies put in place in the last one year.